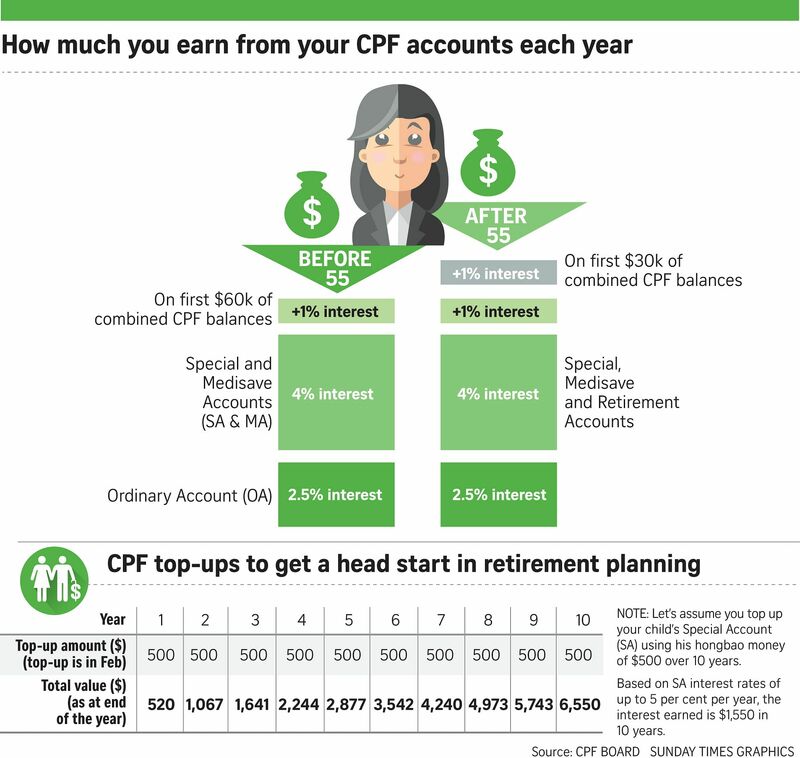 Ms Goh Sin Lian, 62, started topping up her 82-year-old mother Gan Joo Eng's Central Provident Fund account under the CPF Retirement Topping-Up Scheme in 2006. For 10 years, she topped up Madam Gan's Retirement Account (RA) with a yearly cash lump sum of $3,500, which translates to about $300 in monthly payouts. Ms Goh recalled that she began the top-ups because there were times when she forgot to give her mother the monthly allowance of $300, and her mother felt bad if she had to remind her daughter. "My mother gets the same amount ($300) from the CPF payouts and, on top of that, I enjoy tax relief. The CPF payouts are paid promptly into her bank account every month and she can withdraw them. So, it removes the burden of me forgetting and feeling bad about it," said Ms Goh. Initially, her top-ups were done towards the end of the year, in time to qualify for tax relief. She later realised that if the top-ups were done earlier in the year, the monthly payouts would be slightly higher owing to higher interest earned. When her husband Lim Kwan Yeok, 68, retired at age 59, Ms Goh topped-up his RA also with a yearly amount of $3,500. She continued her yearly top-ups to both her mother and husband until she stopped working in 2015 due to a job restructuring at her workplace, where she was a director. Since last year, Ms Goh's daughter Lim Qiao Er, 38 - an executive in a courier firm - has taken over the topping up of Madam Gan's RA. However, instead of a yearly amount, Ms Lim's contribution is via a monthly Giro deduction of $300 from her bank account, or $3,600 a year. Ms Goh and her husband live in a four-bedroom, 2,600 sq ft condo in Katong with her mother. They have four children, aged 38, 36, 24 and 22.